Grain elevator sunrise at Ponteix, SK. Copyright by Bob St. Cyr. “I have been interested in prairie landscapes photography since my early beginnings in photography back in jr. high school. 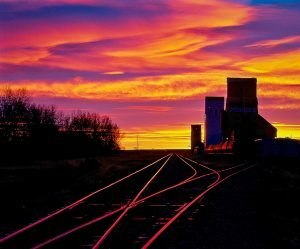 It was such a great feeling as a teenager to have a picture published in the Western Producer of a curving train track with the elevator silhouetted in the background as the sun set in my hometown. See Bob at PhotoBob’s Atelier and on Instagram.